Cheering echoed throughout the streets of Sydney in November 1937 as some 60,000 people gathered along the last 80 kilometres of Hubert Opperman’s epic trans-continental ride. 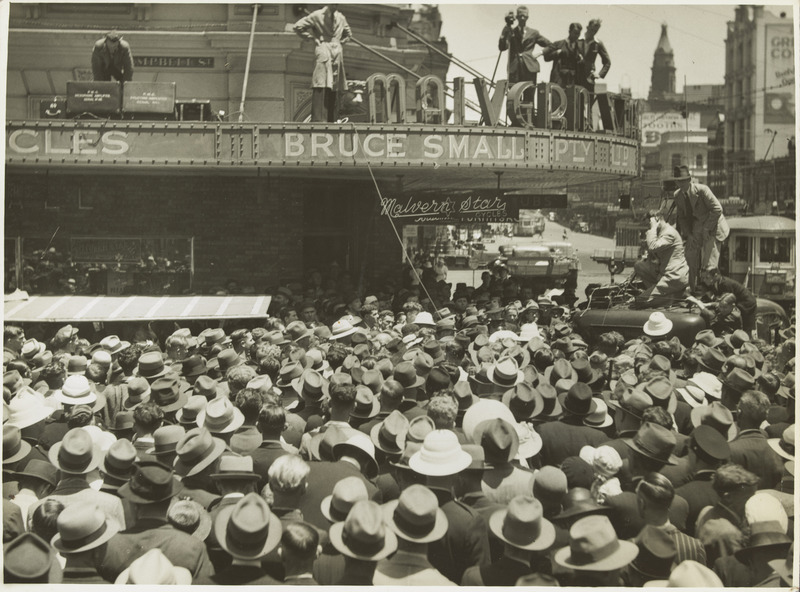 Opperman, exhausted, was met by a chaotic and excited crowd exactly 13 days, ten hours and 11 minutes after he began his ride in Fremantle, Western Australia. Police sirens heralded a convoy of hundreds of cars and cyclists. Officials were unsuccessful in their calls for calm but urged the wildly enthusiastic supporters to, at the very least, refrain from slapping Opperman on the back: he was severely sunburned. All over Australia, people tuned into the event via live radio broadcast. 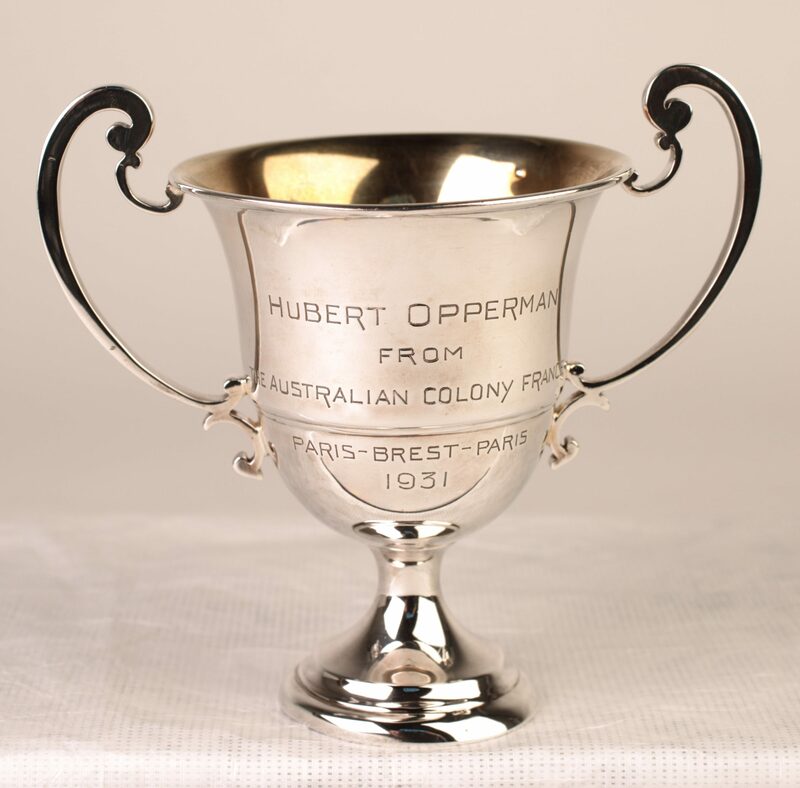 Hubert Opperman or ‘Oppy’ as he was affectionately known, was once as famous as cricketer Don Bradman or racehorse Phar Lap. He competed in endurance events across Australia under the sponsorship of Malvern Star, whose proprietor, Bruce Small, was one of his greatest champions. Together, Bruce Small and Hubert Opperman made the Malvern Star name known all over Europe by racing in European endurance events and winning the hearts of French cycling enthusiasts. The decision to clean the heavily tarnished Paris-Brest-Paris Race cup trophy for display was considered carefully. 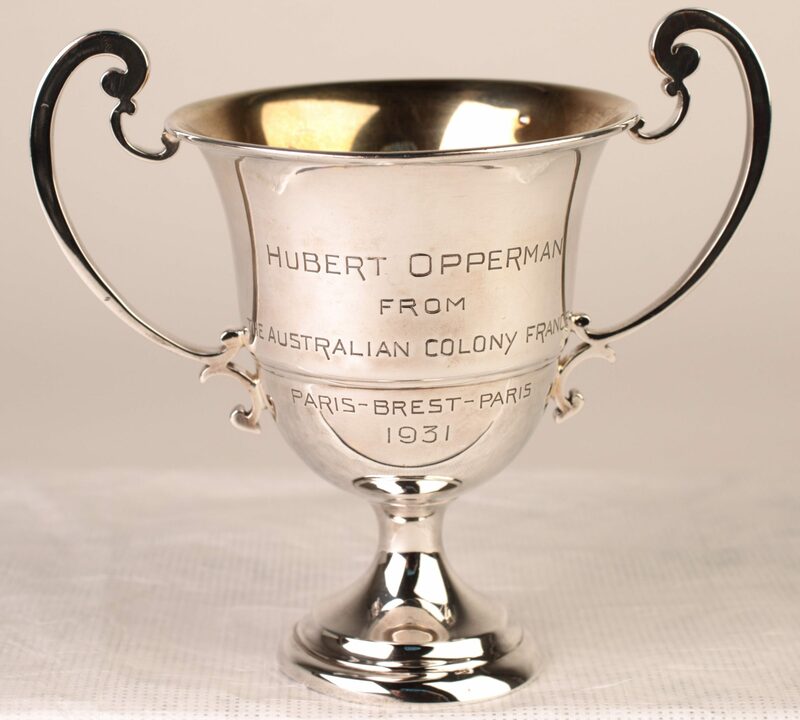 On one hand, there was a desire to show the cup in a highly polished condition, as it would have appeared when presented to Hubert Opperman in 1931. Cleaning the cup also presented an opportunity to reduce fingerprint marks, which over time may cause etching on the surface and become more difficult to remove. On the other hand, removing tarnish also means removing minute amounts of silver, so repeated cleanings can result in loss of surface detail or obscured engravings. 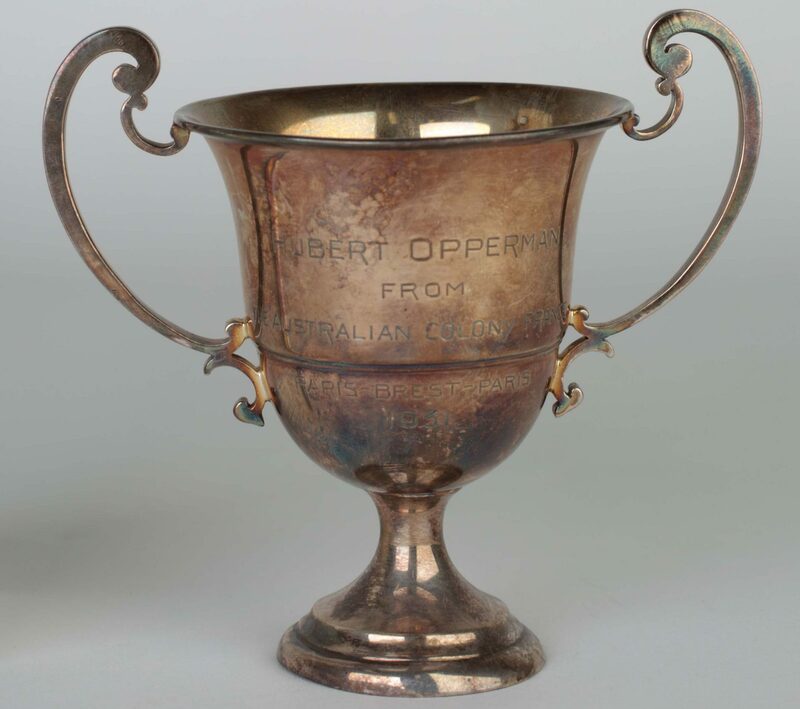 …Accounting for a number of factors, including the likelihood that the cup had not been cleaned or polished since its donation to the museum almost 40 years ago, the decision was made to remove the unsightly black silver sulphide tarnish. Using the mildest and least abrasive methods possible, conservation treatment included brush vacuuming to remove surface dust, degreasing the surface with solvent swabs, and polishing by lightly buffing with a silver cloth. As a result, the cup is now more visually appealing for display, and the engravings are more legible. The conservation treatment sought to retain the bicycle’s history, contribute to its long-term preservation, and allow the object to be displayed in the most historically accurate way possible. A collaborative approach was taken, combining curator Matilda Vaughan’s knowledge of bicycle anatomy and history with conservator Charlotte Walker’s understanding of materials and treatment techniques. Evidence of use, including old animal glue residue on the wooden rims, and ingrained dirt on the fabric tape handlebar coverings, was retained. Likewise, signs of age such as degraded rubber tyres, minor tarnishing of metal, and cracked leather on the seat, were not altered. However, some aspects of the bicycle’s condition were addressed during conservation treatment, notably a build-up of dust and dried grease causing the chain and wheels to become seized, and white fatty deposits obscuring the leather seat. The chain has an unusual screw connection, which allowed it to be easily dismantled, along with the wheels, for ease of access to mechanical parts. 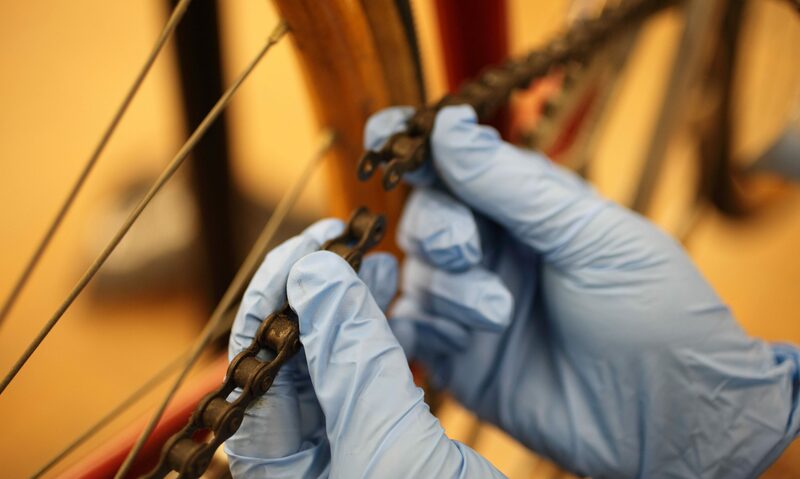 Treatment included brush vacuuming to reduce dust, wet cleaning to remove ingrained dirt on painted and wooden surfaces, cleaning and degreasing metal components such as handlebars, pedals, wheel spokes and hubs, cassette and chain ring, in addition to cleaning and lubricating the chain. White fatty deposits leaching out of the leather seat were reduced, and loose tape on the handlebars was consolidated. 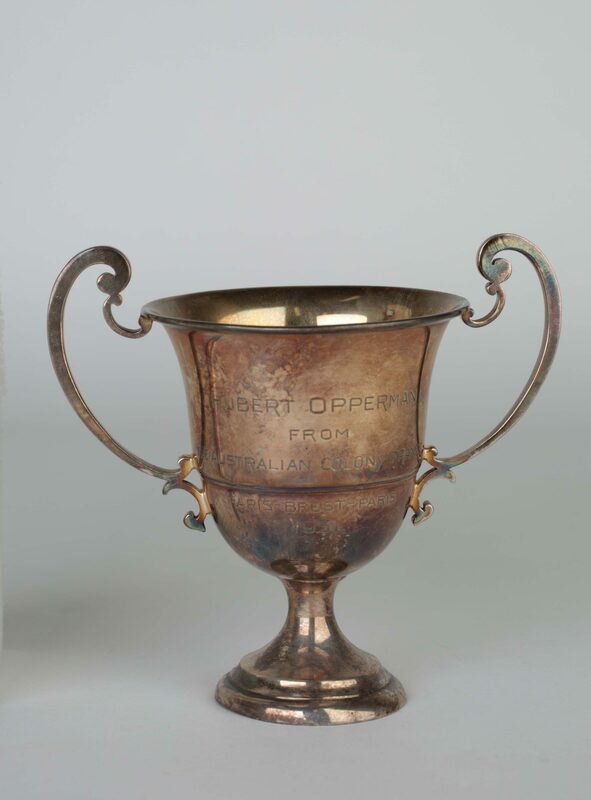 Hubert Opperman donated two bicycles and many of the trophies, sashes and certificates that he won during his cycling career to Museums Victoria. 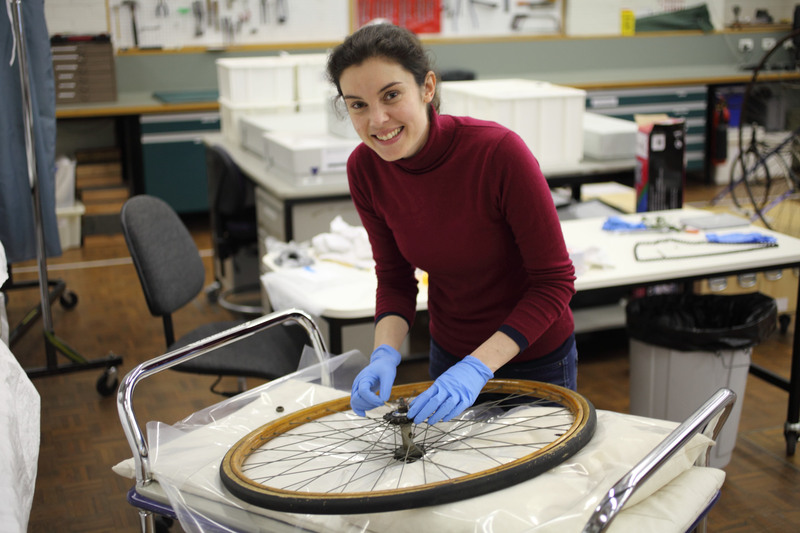 The objects on loan in Changing face of Victoria compliment the library’s collection of material related to Australia’s golden age of cycling. Many thanks to Charlotte Walker and Matilda Vaughan for providing this information and images, and to Museums Victoria for the generous loan of items from their collection. For more information on Hubert Opperman, Daniel Oakman’s recently published biography Oppy: The Life of Sir Hubert Opperman offers insight into the life of a sporting icon and the world of professional cycling. Discover more people, places and events that have shaped Victoria in the Changing face of Victoria exhibition, open daily on Level 5 of the Dome Galleries, overlooking the La Trobe Reading Room. Thanks for your post Kate. The number of cyclists in Melbourne is way less than in Amsterdam and Scandinavian cities. I think cycling to work is not only good for our health but also good for the environment. True! I hope that with increasing poulation density in the cities we will see more use of the old pedal power. I ride to work most days which is great for me and the environment. Daniel Oakman has written a great book just called Oppy. It should not be missed, and he is a great speaker too. I heard him at the Melbourne Museum at the time of the book launch.